Suara Sarawak: Goldman Sachs’ US$200million Charge For 1MDB Bond Issue! Goldman Sachs’ US$200million Charge For 1MDB Bond Issue! Sarawak Report would like to draw the attention of the United States financial regulators to what has emerged as an exceedingly large and unusual payment made during a recent off-shore bond transaction, conducted by one of its major banks. The terms and conditions of the offer note, now in our possession, have lifted the lid on a deal that was widely criticised at the time for its lack of transparency. 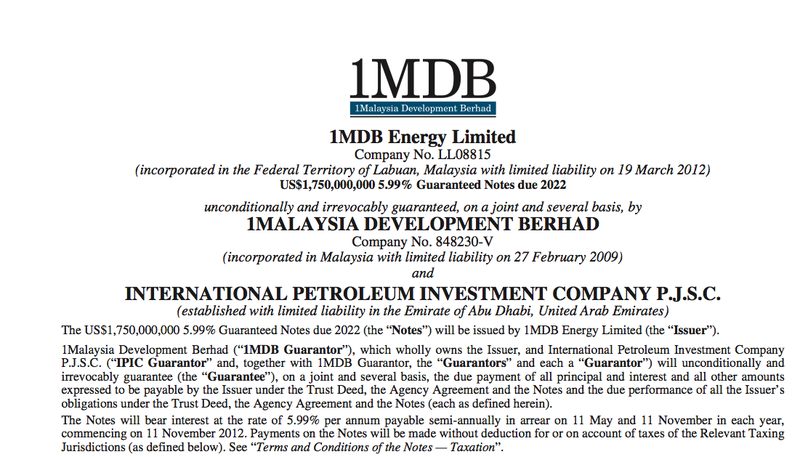 This transaction, which involved the raising of US$1.75billion in bonds to buy an energy company owned by BN crony Ananda Krishnan, was issued in March 2012 by 1Malaysia Development Bhd, headed by Malaysia’s PM Najib Razak. The guarantors were the Malaysian taxpayer and surprisingly the Abu Dhabi state owned International Petroleum Investment Company (IPIC). The widely held view was that the purchase of the company, Tanjong Energy, was unjustified and over-priced, providing a two billion ringgit windfall for the BN crony Ananda Krishnan. There were even more queries over the nature of the issue itself, owing to the secretive handling of such a massive publicly funded bond. The entire issue was privately placed by the US bank Goldman Sachs International (GSI) through off-shore Labuan, rather than on the open market. At the time the Financial Times noted that the deal was “touted as Asia’s biggest sole-led dollar-bond sale ” and “it almost slipped under the radar”. The deal that nearly slipped under the radar, but then popped up on traders’ screens. “The issue was never meant to be made public but somehow it flicked up on bankers’ screens, sparking caustic commentary”, the paper explained. Sarawak Report can now reveal further highly unusual and seemingly irregular aspects to the deal, as outlined in the original offer note, of which we have a copy. Not only were the bonds issued at a staggeringly high rate of interest, 5.99% compared to the 3.59% being raised on an industry equivalent like Petronas, but Goldman Sach’s fees and costs for conducting the “below radar” deal appear to have been astronomical. According to their own offer note a full US$196,200,000 was deducted for “certain fees, commissions and expenses” – nearly $200million! This sum represents around 8.8% of the issue’s total nominal value rather than the normal rates, which might be expected to amount to around 0.25%, according to traders. Nearly $200million deducted from original sum for “certain fees commissions and expenses”! Given that $US200million could make a great deal of difference to the lives of many of the Malaysian taxpayers, who are under-writing this deal, should not more details be provided as to the ”certain commissions, fees and expenses” being referred to? In short, why has so much money been expended on raising this loan when it could have been done so very much more cheaply on the open market? So far, the Malaysian government refuses to be accountable to its parliament, where questions are being persistently asked about this and other similar eye-brow raising loans. We therefore believe that it falls to the US regulators to examine the bank that has been most prominently involved. Indeed, Goldman Sachs International has emerged as the bank of choice for arranging a whole series of such bonds, which have been roundly criticisedfor their secretive and irregular nature, raising enormous sums guaranteed by the Malaysian taxpayer with virtually zero accountability involved. Just 3 days before the dissolution of Parliament before the last election opposition MPs were horrified to learn of an even larger loan that was rushed through in a similar manner. This was a $3billion bond issue (RM9.3billion), again raised by GSI on behalf of 1MDB and again secretively through a private placement off-shore. This is not the regular way in which governments issue bonds. PKR’s Investment and Trade Chairman Wong Chen again expressed shock at the high rate of interest extracted on the loan and also the “gross overpayment” to Goldman Sachs of US$71million for arranging the deal. “The business relationship of 1MDB and GSI is not the issue. However, we are very worried when all bond issuance contracts go to GSI and these fees are not disclosed for comparison to market rates. Were these fees, as reported in Bloomberg to amount to about USD 500 million in total to date, above commercial market rates? Were other bond arrangers/competitors asked by 1MDB to bid for the same work? The core issue here is 1MDB has to be more transparent in its dealings and practice basic corporate governance in having open bids for work.“Wong Chen explained to Sarawak Report. Perhaps most worrying in this case was the failure by the PM/Finance Minister Najib Razak to come up with any reason for raising the vast pre-election loan via his pet instrument 1 Malaysia Development Berhad, which was ostensibly set up to invest in developing the country’s high tech infrastructure. BN later refused to answer rumours that the 1MDB had subsequently invested RM7billion in the off-shore Cayman Islands. They simply refused to account for this astonishing sum raised on the back of state guarantees! Just last week 1MDB announced it had purchased yet another over-priced power venture, again considered in some quarters to be a bail-out of a crony company rather than a genuine high tech acquisition for the benefit of Malaysia. Taib style finances catching on in Malaysia? In adopting this off-shore style of raising mysterious billions Najib Razak can be seen following in the footsteps of Sarawak’s own ‘CEO’, Taib Mahmud. Taib has been raising bonds through Labuan, thanks to the expensive assistance of Goldman Sachs International (GSI) and others for some time. The UK based NGO Global Witness drew attention to the issue back in May, questioning another “under the radar” bond raised supposedly to finance SCORE. In this case it was a US$1.6billion bond issue again raised through Labuan using Goldman Sachs. According to the offer papers, fees for the bank appear to have totalled in the region of US$10million, again well over the normal rate for the job of book-running a private bond issue. 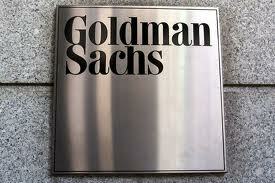 “Goldman Sachs is at serious risk of facilitating corruption by doing business with the Sarawak State Government. If you drew up a list of the most corrupt regimes in the region, this one would be near the top. Goldman Sachs either failed to do proper checks on its clients, or it did them and failed to highlight the risks to prospective buyers of the bonds. The bank has some serious explaining to do,” [Alex Helan, Global Witness]. Similar bonds have been raised through Labuan for Sarawak in the past, in a manoeuvre that banking professionals have described as a highly unusual and indeed questionable way for a state to raise public finances. In 2005 Deustch Bank assisted by UBS raised US$600,000million in this way. What’s wrong with the open market at a lower interest rate? A particularly disadvantageous aspect of these secretive deals has been the high rate of interest they demand. Why, we ask, has Sarawak’s Chief Minister and Finance Minister chosen to raise money so expensively for his projects when a more publicly managed issue on the open bond markets could have been arranged at a far cheaper rate of interest? Since Taib and Najib have remained silent on these matters and libel actions have been threatened against politicians who refer to the enormous ‘Black Hole’ in Sarawak’s development budget, created to finance these secretive borrowing deals, is it not time for other authorities to take notice? Under its Foreign Corrupt Practices Act the United States has prosecuted a number of corporations and banks who have failed to perform proper due diligence or have facilitated corrupt acts. In Switzerland the authorities are already investigating the activities on UBS under parallel laws. And the German authorities have already looked once at Deutsche Bank’s involvement with Kenanga Holdings, the investment company which is co-owned by the Taib family’s CMS. We suggest these authorities start checking through this series of Labuan deals, which have put such a huge and mysterious debt burden on the Malaysian people. The taxpayer has a right to transparency.